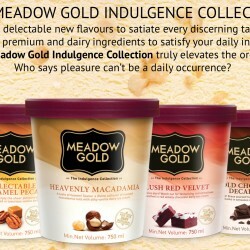 Meadow gold delivers smooth indulgence with every spoonful of its pure and authentic dairy goodness in a premium tub. The inclusion of premium ingredients for an added crunch to this creamy goodness is a sure way to wow even the most discerning ice-cream lovers! This is the last week to enjoy flavours like Bold Chocolate Decadence, Delectable Caramel Pecan, Heavenly Macadamia and Lush Red Velvet at $6.95 per tub (UP $9.90) at major hyper/supermarkets or online supermarket like Redmart till 30 September 2016! BQ likes all flavours, but Heavenly Macadamia is a fave! There's always room for ice cream! 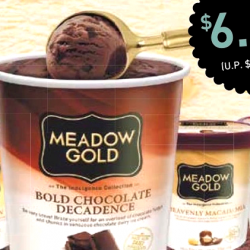 Indulge in Meadow Gold's ice cream with delicious flavours like Delectable Caramel Pecan, Heavenly Macadamia, Lush Red Velvet and Bold Chocolate Decadence! From now till 14 September 2015, you can get any 2 tubs for $14.95 (UP $9.90/tub)!